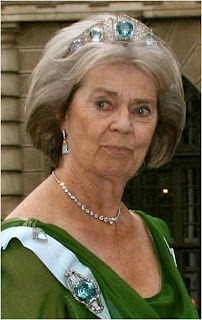 Princess Sibylla of Sweden, King Carl Gustaf's mother, was well known for wearing the Connaught Tiara, but this aquamarine tiara made its mark on her head as well. The large rounded sea blue stones are each framed by diamonds and connected with delicate diamond work. The overall shape resembles the kokoshnik headdresses from Russian national dress, hence the kokoshnik name. The tiara and matching brooch came from the collection of Princess Margaret of Connaught, who married the future King Gustaf VI Adolf of Sweden. She died suddenly at the age of 38 in 1920, pregnant at the time with her sixth child, and her jewels were split between her children. 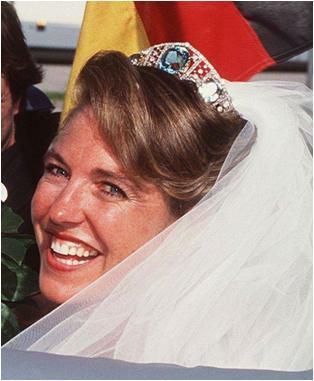 The aquamarine set reappeared on Princess Sibylla of Saxe-Coburg and Gotha during the pre-wedding celebrations for her marriage to Margaret's son Gustaf Adolf. Sibylla wore it from then on. The tiara ended up with Princess Margaretha, the eldest of Sibylla and Gustaf Adolf's five children. Margaretha married a British businessman, John Ambler, and moved to the United Kingdom. As her involvement in royal events decreased, the tiara was seen less and less. The couple's daughter, Sibylla Ambler, wore it for her 1998 wedding, but after that it went completely unseen. Naturally, people wondered if it might have been sold (it was said that the Amblers downsized homes because of financial difficulty, but regardless - you'll find this is a question thrown around whenever a tiara goes missing for any significant length of time). But then the lovely Princess Margaretha surprised us all by popping up in both the tiara and the brooch at her niece Crown Princess Victoria's 2010 wedding! And perhaps she surprised more than just royal watchers - the original press release detailing the jewels to be worn by the family members stated that Margaretha would be wearing the Baden Fringe Tiara. 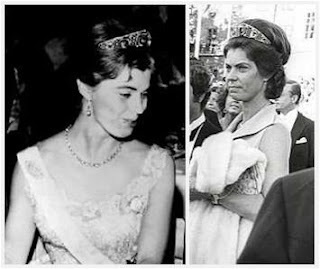 The tiara still belongs to Princess Margaretha, and we've also seen it borrowed by her sister Princess Christina and her niece Princess Madeleine recently. This is one of my favorite aquamarine tiaras, and I'm so glad it's still around. Not only does it make excellent use of such beautifully colored stones, I think the kokoshnik treatment is one of the best ways to handle a large stone in a tiara. Is this a favorite aquamarine tiara for you? Readers' Ultimate Tiaras: Your Big Gun Winner!